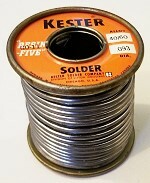 Prior to the big push for leadless solder in the 1990s, probably 99% or more of the solder used by industry, tradesmen, and hobbyists contained lead. The 60/40 Sn-Pb (and 63/47) alloy, both with and without a rosin core, was used for electrical work, electronics, plumbing, copper guttering, radiators, and many mechanical assemblies made of steel, brass, copper, tin, etc. Between World War I, "The War to [Not] End All Wars," and World War II, the electronics industry exploded in growth. All realms of society and government became utterly dependent on products assembled using solder. Both tin and lead were abundantly available, making it inexpensive. Properties of Sn-Pb solder were well known, and methods for is use were simple. At the breakout of WWII, America's main source for tin was a group of countries under the control of Japanese forces. As with a lot of other resources during wartime, tin was regulated and meted out by the government. Alloy makeup was reduced to 16/84 for sale to civilian users, which significantly decreased the strength of solder joints and complicated assembly efforts. I could not find an image of solder labeled as 16/84 alloy. Rosin-core solder as used by radio men is an alloy of tin and lead. No one ever bothered to think about the sources of supply on tin as long as it was possible to purchase a roll of solder with little effort. Now that tin is a strategic metal, are asking, "Don't we have our own tin mines?" The answer is "No." Over ninety per cent of our tin came from Malaya, Burma, Thailand and the Dutch East Indies and, as everyone knows, the J aps are now in full possession there. "What about the fabulous Patino Tin Mines in Bolivia and the new tin smelting plant at Texas City, Texas?" Bolivian tin ores are second rate and they must be mixed with a first-grade ore before they can be smelted economically. The Texas City tin-smelting plant has just begun operations and it is questionable if it will ever be in a position to furnish us with tin for civilian consumption. As it is, it will produce just a small portion of our war requirements. In fact, how well it can do that will depend upon our ability to allocate ships to transport the ore from the Bolivian tin mines to our new smelting-plant. "Is it possible to solder with lead alone?" The answer is no. Tin in itself is a solder that will "wet" or alloy with other metals. Lead when added to tin triples the strength of the solder, lowers its melting point, makes it easier to handle and lowers the cost of the solder; yet lead by itself will not wet other metals and so lead by itself is not a solder. "What about substitutions for tin?" Cadmium, bismuth, indium and silver have been suggested. Cadmium may be alloyed with lead for soldering purposes but at the moment cadmium is a "critical" metal and very much in demand for plating implements of war. Bismuth like lead is no solder. It is used to lower the melting point of solders, but the more bismuth used the more brittle and porous the joint becomes. Indium may be used for soldering but just now the price of $12.50 an ounce is a rather steep price. Silver-lead solders, especially an alloy of 2 1/2% silver and 97 1/2% lead is being as a substitute for tin-lead solders. This alloy compares favorably in price with tin-lead solders but unfortunately for the radio man it is difficult to use with a soldering-iron. The radio man with his 50-, 60-, or 100- watt iron will find this solder sluggish because of its higher melting point, 580°F. It will require a 150- or 200-watt iron and even then the continued use of the iron is difficult because the faces of the iron oxidize readily with so much lead in a solder. The Tin-Lead branch of the WPB has ordered all solders for civilian consumption to be reduced to 16/84, that is, 16% tin and 84% lead. This solder can be used successfully by the radio man with a 150- or 200­watt iron. 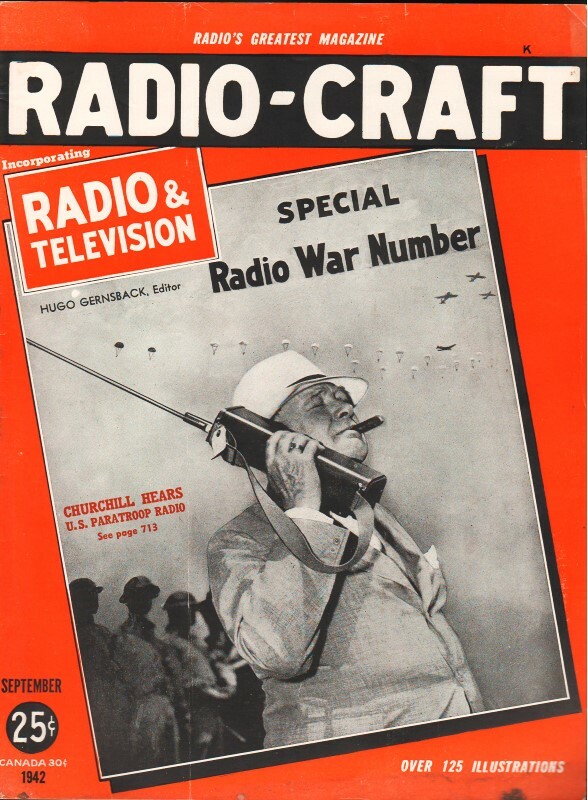 A resourceful radio man may not have to be without solder because it is possible to make his own. Prior to the outbreak of war all shaving-cream toothpaste and salve tubes were made of almost pure tin. Tinfoil used as food wrappers, tinfoil from old radio condensers (beware aluminum foil), tin bearings from connecting rods and pewter ware may be alloyed with lead to make solder. To make strip solder melt your scrap in a ladle and pour it on either an iron or marble surface. If you plan to add tin to your lead, melt the lead first and add the tin. A solder containing as little as 5% tin and the balance lead is preferable to any silver-lead alloy for radio use.